Dennis S. Juett & Associates Inc.
Have you heard about the new "micro-amusement" park in town? 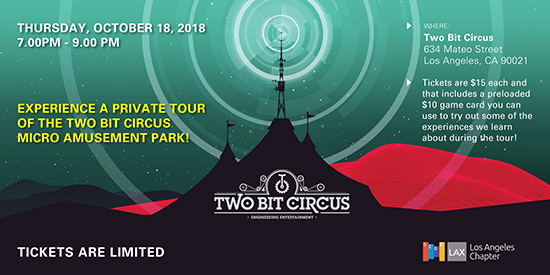 Two Bit Circus is a 38,000 square feet wharehouse located in the Downtown LA Arts Disctrict and it is loaded with interactive and VR experiences along with classic gaming. Our group has been given a unique opportunity to receive a tour of the arena with the creative director from Two Bit Circus! 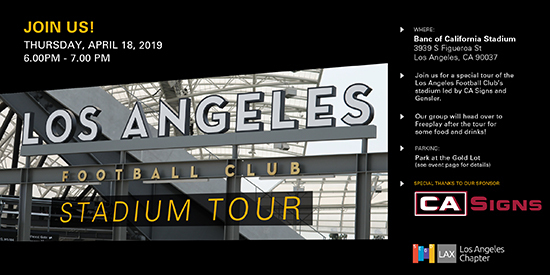 During the tour we will hear about the design process involved in creating all the graphics and signage, what it took to get the place up and running, and some insight on the technology being used. Each ticket comes with a $10 preloaded gaming card so you can try out some of the experiences after the tour! Unfortunately, due to all the noise and foot traffic that will be going on during operating hours, the tour size will be small and there are a very limited amount of tickets available! Get your ticket asap. Didn't get a ticket in time? 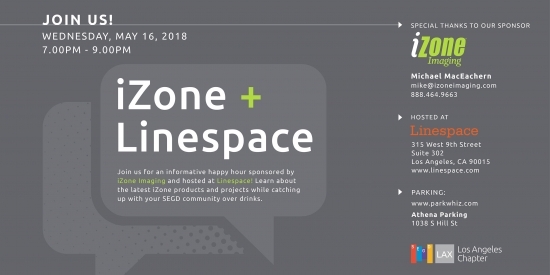 You can still show up to the venue to check out the arena, play some games, have some food or drinks and meet up with your friends when their tour concludes. 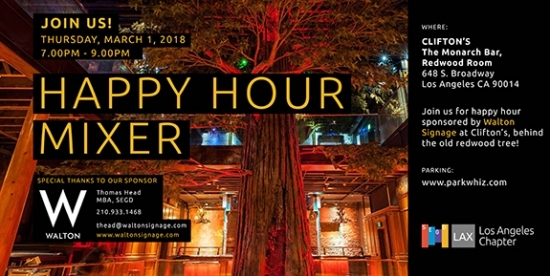 Please join us on Thursday, March 1 at Clifton's for a happy hour mixer sponsored by Walton Signage! We will be in the Monarch Bar by the Redwood tree starting at 7pm. 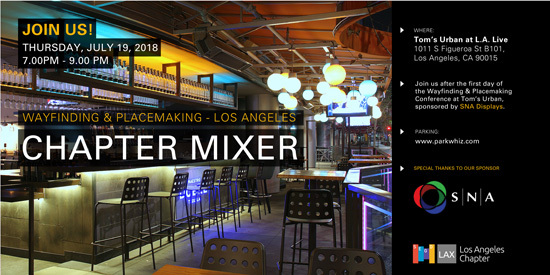 About Walton: Founded in 1980, Walton Signage is a $50+ million company focused on providing turnkey signage solutions and exceptional service to the restaurant, retail, banking, finance, hospitality, healthcare, grocery, entertainment, automotive, service and petroleum sectors. For more information, visit www.waltonsignage.com or contact Thomas Head at [email protected], 210.933.1468.